Are you considering joining the March active study group on using prophetic veils in prayer and praise? If so, I’ve created a list of FAQs to help you discern whether this group is a fit for you. 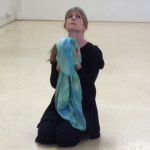 I end this blog post with a choreographed prayer that I wrote and prayed using veils. 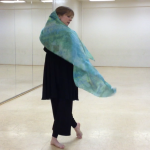 Veils add beauty, glory, drama, and effect to presentation dances. 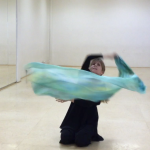 They help tell a story and enable us to more effectively communicate emotion when dancing. There is also something intimate about a veil that is distinct even from flags and streamers. So, I find them uniquely suited for prayer and devotion. 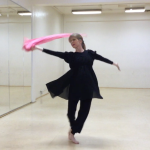 I have been enjoying dancing and praying with the veil I purchased recently. I love to toss it on my shoulders when I am doing my modern dance workout in the morning and to pick it up when praying and make the movements an act of prayer. I have packed it in my suitcase when traveling in order to pray for the people I’ve been visiting and even over their home. And as I’ve done this, I’ve developed a desire to share what I’m learning with other worshipers, and to learn with them how to incorporate this tool into their own prayer and praise. So, I invite you to join me for the active study group I’ll be holding in March. 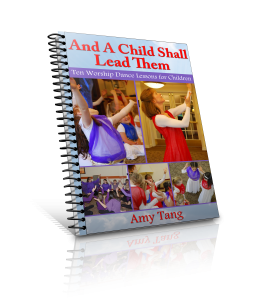 You will gain understanding and technique to broaden and deepen your dance, you’ll nourish your own soul as you study, and you will be blessed by the fellowship. To answer your questions about this group, I’ve created an FAQ sheet from the questions I’ve been answering for people. I hope you find this helpful. If you have other questions, please don’t hesitate to ask. What is an active study group? It is a group of worshipers who are together studying how to use veils in prayer and praise. It’s active because there will be regular suggestions for simple movement exercises you can use with your veil. It’s a study group because we will be studying the biblical significance of using this tool in prayer and praise. This will be a community. So, you will also be invited to share what you are learning, upload pictures or videos of movements/activities that have been meaningful to you. There is no requirement for you to post, but posting is a way of connecting with others, building community, and deepening what you are learning by expressing it to others. How will it work? I’ve created a private Facebook group where I will be posting at least 3x/week. Once a week, I will post a video with suggestions for how to use your veil in prayer. Other days I will include scriptures to meditate on and to use your veil to embody. I will suggest simple devotional activities you can try in your own prayer time. 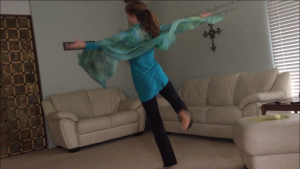 I will also share short teachings on the spiritual significance of dancing/praying with these veils. Lastly, I will share other resources that to help you grow – videos, blog posts, songs, DVDs, and books. Who is this group for? Anyone who wants to deepen their relationship with the Lord by engaging in active bible study and movement exercises using prophetic worship veils. Do you need dance experience? You do not need previous dance experience. This isn’t a dance class, it’s a devotionally group. What is the weekly commitment: This is an active study group, not a class. I will be suggesting activities 3x/week for you to experiment with. The more time you spend in prayer/praise, meditating on the scriptures, and experimenting with the activities, the more you will get out of it. However, this is for you, so you are encouraged to participate to the level of your own availability. I’m preparing for a ministry presentation. Do you think that joining this group in addition to attending the rehearsals I’ll be attending for that will be too much? This group could be perfect for preparing you for your presentation. If you already spend time daily in prayer and bible study, this doesn’t need to be an extra activity. Rather, it will give a particular direction and focus to your devotions. What are the times of the study group? You can participate on your own timetable. Once you are been added to the private Facebook group, you can look at the posts and videos and apply the suggestions at the times that work best for you. There will be a weekly prayer call that you can participate in on Wednesdays at 9:30-10:00 am PST. This call will be recorded, so that, if you miss it, you can listen in. Can I invite a friend to join? Absolutely. If you have a friend that you think would benefit. They can register here (scroll down to the bottom of that page) and will be added to the private Facebook group. How long with the study group last? It will run from March 1 through March 31. Do I have to have a veil to participate? No, you can register for the group even if you don’t have a veil. Is there a cost? Registration is $15. However, if you purchase (or have purchased) a veil from All for His Glory Ministries or from me, you will get access to the study group at no cost. To register or to purchase a veil, click here. If you have any other questions, please post them in the comments section. Lastly, I want to share with you a prayer that wrote, an expression of my need and my hope, and put to movement with veils. Thank you, once again, for allowing me to be part of your life. Thank you, Gail. You have beautiful items on your site.